Due to adverse weather conditions, we won’t be meeting tonight (1st December) at the White Rock Hotel. Instead, we will be having a virtual Knit & Chat in the Ravelry Chatroom of Jo’s Limegreenjelly group. Come and join us at 7:30pm onwards! You do need to be a Ravelry member to access the chatroom, but signing up is quick, easy and free! So far, all meetings are at the usual time of 7:30pm – 9:30-ish, and will be at the White Rock Hotel. Posts will be made here and in the Ravelry group if anything changes! As well as our usual meeting times, KnitJam members have also taken part in a few outside, or extra activities this year. 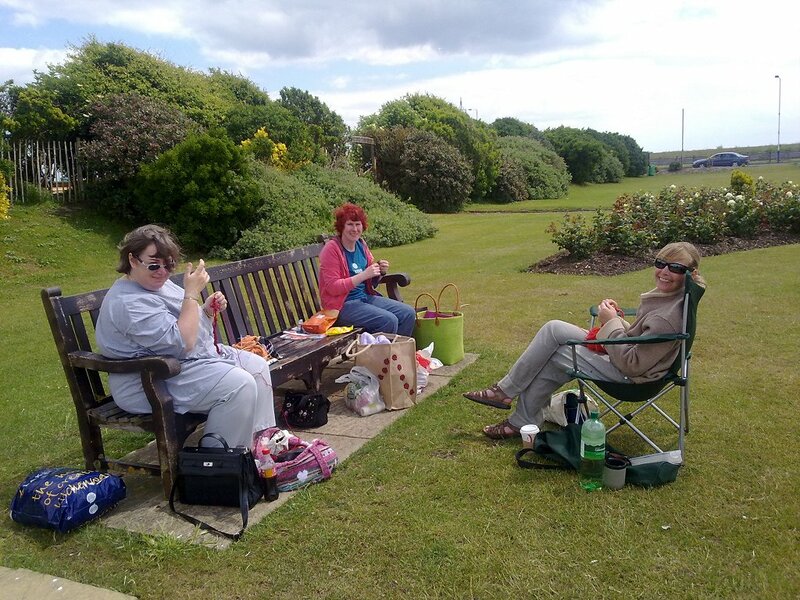 In June, some of us travelled to Eastbourne to participate in a small meet for World Wide Knit In Public Day in Princes Park, and took the opportunity to work on the Big Sock project while we were there. Different groups are working on different sections, so we were casting on the heel. 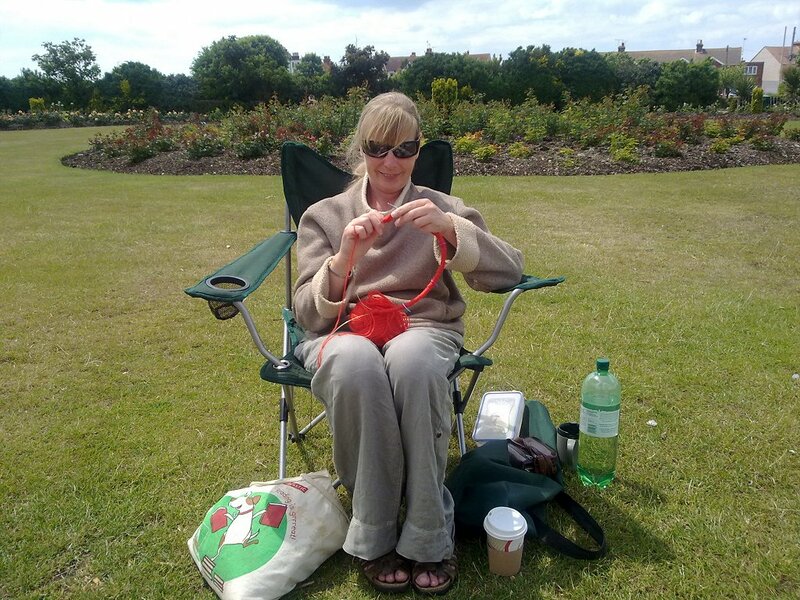 It was a lovely day for knitting out in the fresh air, and hopefully we can do it again next year! More recently, on October 16th, two of our members (Jo and Lesley) gave a spinning display and knitting surgery at Hollington Library in St Leonards. Thanks to everyone who dropped by, and to the library for arranging the event! Welcome to the KnitJam Hastings & St Leonards website. We meet every 1st and 3rd Wednesday of the month at 7:30pm, in the White Rock Hotel on Hastings Seafront (opposite the pier). Come along and join us any time – we welcome beginners to experts in all types of fibre crafts. See the About Us page for more detailed information on who we are, and look below for any updates on meeting times and venues, or extra events.